Mass demonstrations for democracy are quite common. Rarely have we seen people take to the streets to oppose democracy. In early 2011, mass protests broke out in many Arab nations that at least initially were broadly calling for a greater say in the governance of their country. Historically speaking, the scene was not altogether unfamiliar. Particularly since the start of the 20th century, the world has fairly frequently witnessed people taking to the streets en masse to demand a more democratic government. These protests have stretched the world over, from Africa and Latin America to Eastern Europe and Eastern Asia. That is not to say that democracy is on an unalterable march across the globe, or to say that history is ending in the Hegelian sense of the word. Some of these protesters have been some successful while others have not. Some have successfully toppled the regime in power only for an equally repressive one to rise up and replace it. As Samuel Huntington convincingly argued, democratic movements tend to come in waves but are then followed by periods where authoritarian regimes reassert themselves. Still, even when democracy is rolled back it is usually through coups or civil wars or some sort of illegitimate seizure of power. Occasionally, such as in the case of Nazi Germany or the Islamic Republic of Iran, a regime will initially come to power because of its mass support, but will then brutally abuse state power to stamp out any potential challengers to its rule. Rarely, however, do we see people take to the streets in large numbers to demand that an existing democracy be replaced by military rule, a dictatorship, or some other form of non-democratic government. Egypt in 2013 may be an exception. In that case, we saw mass protests erupt demanding that the democratically elected Muhammad Morsi be ousted from power, and these protesters cheered when the military obliged their wishes by mounting a coup against Morsi and the Muslim Brotherhood (Morsi’s large number of supporters were not cheering, however). Still, what we are currently witnessing in Thailand with the Yellow Shirt protesters who shut down parts of Bangkok on Monday is altogether different. In Egypt, most of the protesters seemed to support the military only in so far as it formed a caretaker government that promptly restored democracy (of course, with limitations on the Muslim Brotherhood’s participation). In other words, they wanted Morsi and some of the Muslim Brotherhood gone, and were quite willing to support non-democratic means to achieve this goal. Still, they were not demanding that democracy itself be eliminated indefinitely. As this suggests, although Morsi and the Muslim Brotherhood had won a majority of votes on at least three different referendums, by the time of his ouster all evidence suggested that he no longer maintained majority support from the population. Even if he still had large numbers of fervent supporters, most analysts believed he and his party would have lost power in subsequent elections. In all these ways, the unrest that has afflicted Thailand since late November—which is just the latest round in a continuous struggle between Yellow and Red Shirt supporters—is fundamentally different. In Thailand, the Yellow Shirt movement led by Suthep Thaugsuban, which is closely aligned to the opposition Democratic Party and comprised largely of “old-guard” elites concentrated around Bangkok, has been staging mass demonstrations against democracy itself. As in Egypt, they have most immediately called for the immediate ouster of the current administration, and through their actions they have similarly seemed intent on trying to convince the military or some other government institution to help them achieve that goal. 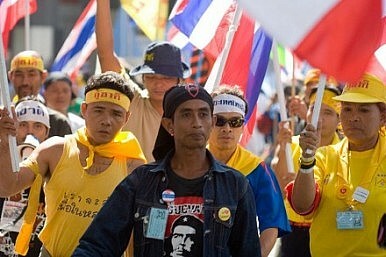 However, in stark contrast to Egypt in 2013, the Yellow Shirt protestors are more generally demonstrating against having a democratic government in Thailand. Nothing underscored this better than Prime Minister Yingluck Shinawatra and her Red Shirt supporters voluntarily agreeing to dissolve parliament and hold snap elections scheduled for early February. It would have been unthinkable for Morsi to agree to such a move in Egypt, as well as for Morsi’s detractors to oppose holding new elections had he agreed to them. Yet this is what has happened in Thailand. Yingluck’s willingness to agree to this move was based on a sound calculation that the populist Red Shirts would easily prevail given their overwhelming support in the populous north and northeastern parts of the country. Suthep and the Yellow Shirts are entirely aware of this, having lost every national election since 1992, which is why they have continued and even tried to expand the protests. By calling for the election, Yingluck hoped to make it more difficult for the Yellow-leaning military to mount a coup. By continuing and expanding the protests, Suthep hopes to force the military’s hand before the election can be held. Should he fail to prevent elections from being held, the opposition Democratic Party hopes to delegitimize them by not fielding candidates and dissuading their supporters from voting, a tactic that has served them well in the past. Thus we have a peculiar situation in Thailand in that most of the mass protesters are taking to the streets in an attempt to subvert democracy permanently. Being comprised of the diverse groups that made up the “old guard” in Thailand politics, they hope to restore military rule or perhaps even a politically empowered monarchy in order to suppress the will of the majority of the population, particularly the poor and rural classes. With the new round of hype over potential polls in Thailand has come a focus on parties, players, and who the future prime minister could be.